7:30 pm. At Temple Emanuel of Beverly Hills, 300 N. Clark Drive, Beverly Hills. In the intimate chapel. Tickets, $15 thanks to sponsorship from The Jewish Journal and Temple Emanuel of Beverly Hills. Journalist and secular thinker Sara Davidson has authored a book with many such questions. A skeptic through and through, she jumped at the chance to meet with Jewish Renewal Movement leader Rabbi Zalman Schecter and explore what he calls “life’s greatest mystery.” He proposed a series of discussions about the “December” of life, between a person of faith and a skeptic. 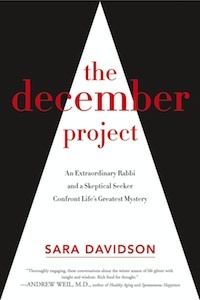 The result is Sara Davidson’s new book, The December Project, that is certain to be a much discussed investigation into what we might think about as we age, topics that center around dignity and practicality, and for those who are interested, a spiritual dimension as well. Sara Davidson, author of Loose Change and other works, will chat with Rabbi Laura Geller and The Jewish Journal Editor Susan Freudenheim about questions that we might want to consider and discussions we might want to have with loved ones– sooner, rather than later.